Safety Net is happy to announce our new Digital Services Toolkit, filled with resources for local programs who are considering providing services via text, chat, video call, and other digital technologies. Whether your program is just curious, in the process of selecting a vendor, or wanting to improve the privacy and safety of services you already provide, this Toolkit is for you! In addition to written resources, we’ll be offering a series of webinars in late Spring covering these topics, as well as tailored technical assistance to answer any of your program’s questions. Contact us for more information. We are now accepting presentation proposals for the 2019 Technology Summit. Proposals are due Friday, January 18th.We’re seeking proposals for workshops that provide tools and information to respond to technology abuse, help survivors of abuse use technology safely, enhance services for survivors, and hold offenders accountable. Proposals should be survivor-centered, trauma-informed, and include culturally competent approaches. The session content should include innovative strategies and support best practices. All workshops will be 60-90 minutes long. Follow this link to submit your proposal for the 2019 Technology Summit. This unique 3-day training summit focuses on the intersection of technology and domestic violence, sexual assault, stalking, and trafficking. Covering a wide range of technology-related issues, this conference will be helpful to advocates, law enforcement, and legal professionals who work with survivors of abuse. For more information about previous years’ events you can visit the Technology Summit page or check out the Technology Summit 2018 Program Book. 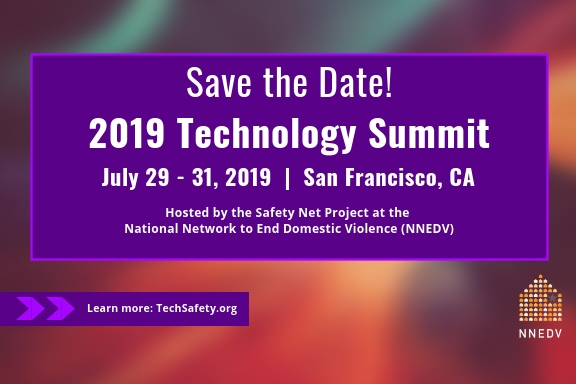 Registration for the Technology Summit will open soon and will be announced with other information through our listservs and on techsafety.org. We have applied for OVW approval. Please feel free to contact us at safetynet@nnedv.org if you have any other questions. We hope to see you in San Francisco! The Safety Net Project spent 2018 continuing to provide training, technical assistance, and advocacy to the field around the intersection of technology and intimate partner violence. In the coming year, we look forward to implementing new trainings and toolkits and continuing to work with partners and funders to address all the ways technology intersects with safety and privacy for survivors. Here’s a quick look at some of our 2018 accomplishments and some of the good work we have ahead of us in 2019. This year we answered over 1,400 requests for technical assistance, spending 775 hours on technical assistance consultations! The most common requests were related to relocation and privacy issues for survivors, responding to technology misuse, and agency use of tech. In need of Technical Assistance? Fill out our Technical Assistance request form. In 2018, we spent almost 400 hours providing trainings to victim advocates, legal services organizations, law enforcement officers, technology companies, and other community stakeholders. We had the privilege of providing training to not only U.S. based agencies but also internationally. This included agencies in the UK, Singapore, Australia, and Austria, among others. Trainings we provided covered a wide range of issues at the intersection of technology, safety, and privacy. Safety Net is already scheduling trainings throughout 2019! In September, we launched the much anticipated Legal Systems Toolkit: Understanding & Investigating Technology Misuse. This toolkit helps legal system stakeholders, including law enforcement, attorneys, court personnel, community corrections, and others identify what technology is relevant to a case and how to use technology evidence to hold offenders accountable. This year, we hosted our Technology Summit 2018 in San Francisco with our highest attendance rate to date. We had over 320 participants and a great group of technology company representatives and amazing presenters. We also hosted a closed Women of Color in Technology Reception, a closed meeting for Coalition, Territory, and Tribal Coalitions, and an opening reception with demonstrations from technology companies and stations where participants could try products and learn more about technology and privacy. In Spring 2019 Safety Net, in partnership with the National Council for Juvenile and Family Court Judges, will launch the Cyberviolence Court Training Initiative Judges Workshop. This national training will use a new training curriculum to enhance the skills of judges presiding over cases where there is technology misuse. The Smart Victim Tech: Equipping and Empowering Victims through Safe Technology Project is an innovative, multi-pronged approach to advance the use of technology to assist victims of crime. In 2019, the project will be releasing a Digital Services Toolkit, and will fund access to the newly launched ResourceConnect secure communication platform for interested local victim service providers, and will launch a new evidence collection app for survivors. Lastly, there were some big team transitions in 2018. We said goodbye to Alex Palacios who continues to do victim services work back in his home state of Arizona. We welcomed back Deputy Director, Kaofeng Lee, who worked for two years with our sister Safety Net project in Australia and Rachel Gibson who worked with the National Center on Reaching Victims. We also welcomed Elaina Roberts, who was formerly with the Stalking Resource Center. Looking ahead, we will welcome our newest and smallest Safety Netter in January with the welcomed addition of our Director, Erica Olsen’s, baby! As the year ends, we reflect on the gratefulness we have for our supporters, tech advocates, funders, and all who work to end violence. We are also grateful to the survivors and direct service advocates who provide us with feedback to guide our work and make us better. We are looking forward to expanding our work to help enhance safety protections for programs and survivors and what #TechSafety means for all. The month of July is always jam-packed for the Safety Net team. This past July, we hosted the 6th Annual Technology Summit in San Francisco, California. This year saw more participants, more sessions, and more ways to connect than ever before. We welcomed over 300 staff, victim service providers, law enforcement, trainers, and technology partners to engage, connect, and learn more about the intersections of technology misuse and intimate partner violence. Here are some of the highlights from this year’s spectacular summit! 1. “Technology isn’t the problem, abuse is!”- Our very own Erica Olsen, Director of the Safety Net project, opened the week with foundational principles. She centered the training with reminding participants that we need to hold perpetrators accountable, while also allowing for survivors to choose what is the best option for them during their tech safety planning process. 2. 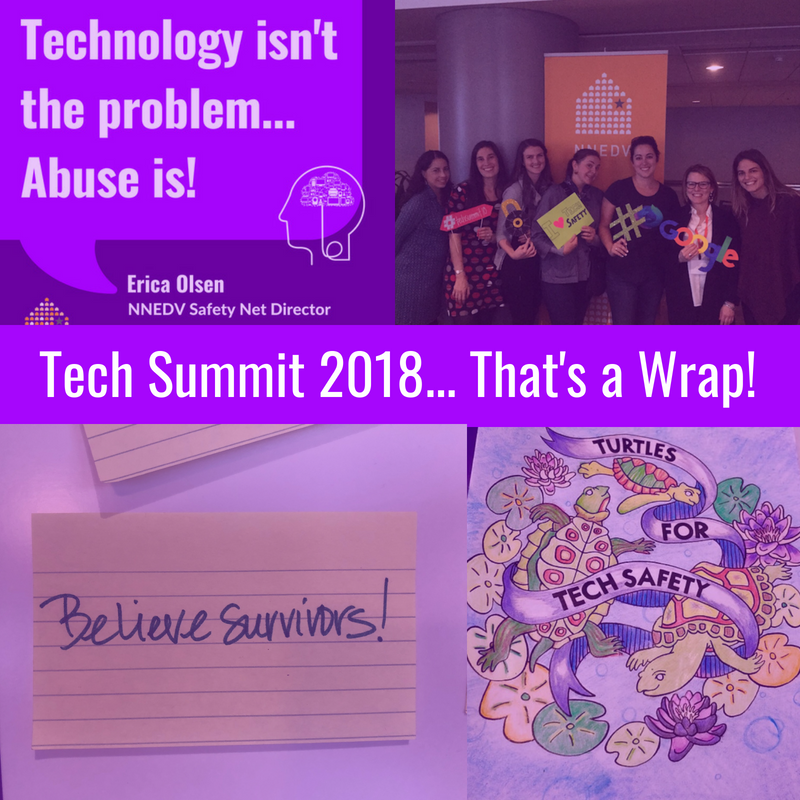 “Technology is often misused, but technology can also empower survivors” - Malika Saada Saar, Google - Our 2018 tech summit speakers and presenters left us feeling empowered and energized to continue this work. We had representatives from Uber, Facebook, Google, law enforcement, and many other phenomenal presenters who not only shared their knowledge and expertise, but their own stories and ways they work to end gender-based violence. We couldn’t have done this without them. 3. “Technology can be used to reach those at the margins and provide them with a safe space”- This year we had sessions that really spoke to the intersections in which many survivors live. We offered sessions on technology and accessibility, working with immigrant survivors, and the impact of technology on LGBTQ survivors. These sessions were an added bonus to our agenda and provided new and innovative approaches for advocates to do this work. Likewise, we held our 3rd annual Women in Technology reception where technologists and advocates came together to discuss emerging tech and the use of technology in communities of color. 4. “Lots of work, but lots of fun”- #TechSummit18 wasn’t just all work, we were able to have fun with our participants. From live polling, tech themed coloring pages, our daily prize drawings, and of course karaoke and trivia, this year we engaged with participants in ways we haven’t in the past. We were able to enjoy each other and really provide connections that will foster new friendships and networking relationships. We thank all of the participants, speakers, sponsors, and you for making Tech Summit 2018 a huge success. Until July 2019. The Internet of Things (IoT) refers to internet-connected devices that are able to connect with other devices and to be controlled remotely through a device or app. IoT devices have become commonplace in many homes and can serve as important tools for increased efficiency and for users to connect with friends and family. Unfortunately, IoT devices can also be misused to stalk, harass, and surveil. For more information about the misuse of IoT devices, check out Thermostats, Locks and Lights: Digital Tools of Domestic Abuse, a recent New York Times article in which NNEDV was interviewed regarding the misuse of “smart home” devices in domestic violence cases. Smart cars & driverless vehicles. Technology is constantly changing, so stay connected to Techsafety.org for upcoming new content!